This unusual surname, recorded in Church Registers of the south-eastern English counties of Sussex and Essex from the early 16th Century under the variant spellings Helmer and Hellmore, and in Germany as Hel(l)mer and Helmor, has three distinct possible sources, each with its own history and derivation. As an English surname, Helmore is of Anglo-Saxon origin, and a locational name from some minor, unrecorded, or now "lost" place called Helmer or Helmore, believed to have been situated in the south-east of England because of the high incidence of early surname recordings from that area. The component elements of the placename are either the Olde English pre 7th Century "heale", corner, recess, or the Olde English "helde", tansy, a yellow-flowered plant, with "mere", lake, mere, or "mor", moor, fen. In 1540, one Johannes Helmer was recorded in Birdham, Sussex; Marie Hellmore was married in London, in 1644; and on October 16th 1759, Martha Helmore married James Tarling at Little Hallingbury, Essex. 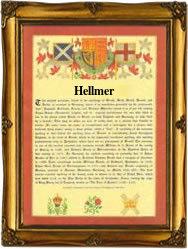 As a German surname, Helmer is either an occupational name for a helmet maker, from the Old German "helm", helmet, with the agent suffix "-er", or else derived from the Old German male given name "Hildemar", battle-famous. On March 1st 1570, Anna Hellmer was christened at Mittelfranker, Bayern, Germany, and on September 21st 1763, the christening of Ludwig Helmor took place at Pirmasens, Pfalz, Rheinland. The first recorded spelling of the family name is shown to be that of Halice Helmer, which was dated June 12th 1540, marriage to Richardus Reyd, at Birdham, Sussex, during the reign of King Henry V111, known as "Bluff King Hal", 1509 - 1547. Surnames became necessary when governments introduced personal taxation. In England this was known as Poll Tax. Throughout the centuries, surnames in every country have continued to "develop" often leading to astonishing variants of the original spelling.